In the classic Empire of the Petal Throne setting, the original author and man behind the scenes (Professor Muhammad Abd-al-Rahman Barker) ran a huge megadungeon under the main city of the setting (Jakalla). The Jakallan underworld was a massive structure that took up a desk-pad-sized sheet of 10 square per inch graph paper. While I’ve done some work fiddling with the original map of the location (thankfully the Tekumel Foundation has a lovely 600dpi scan of the original map in question), it also inspired me to take another poke at drawing a megadungeon in a distinctly different style than the Dyson MegaDelve I drew at the end of 2014 & beginning of 2015. This dungeon I hope to put together as a massive sprawling series of maps that can underpin an entire city map – mixing crypts, sewers, dungeons, basements, and old construction into one massive underworld structure that is accessible in various parts from places in the city above. This particular map contains two access points from the surface, both on the bottom edge of the map – basements with stairs leading down to a great hall on the left (probably linked to a clan house or similar structure, or perhaps the doorway has been boarded off, bricked over, or otherwise sealed to prevent whatever lives in the dark recesses from coming up), and a set of stairs and doors leading into a series of crypts on the right (probably linked to a temple that stores the revered dead in crypts, tombs and so on). And of course, to suit the sprawling style of this dungeon, there are four exits that will lead out to new maps – hopefully one or two published every month for the next while. This is fascinating! I hope you won’t let this one drop like the Dwimmermount re-draw did! 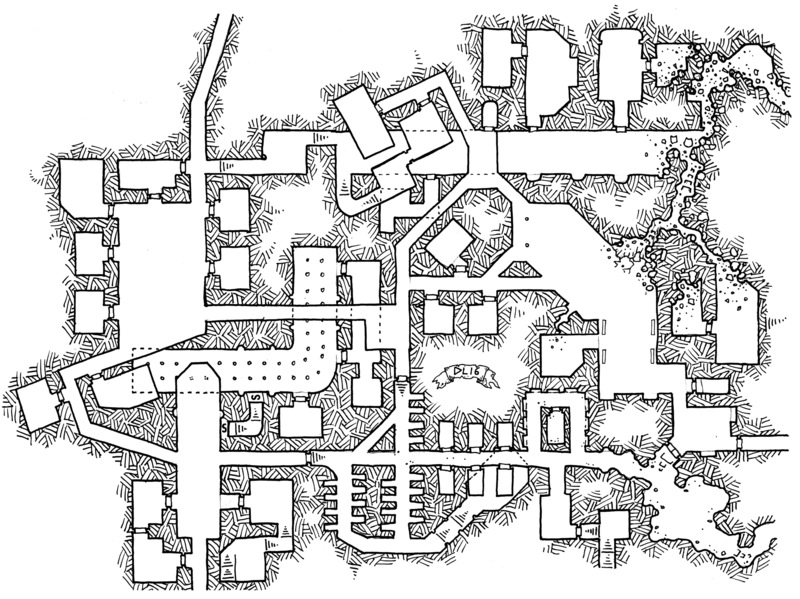 Please keep this megadungeon coming — an “undercity” is just what we need out here in RPG-land! I am going to use this in my EPT campaign. Should be fun. I didn’t know the original map was available, where can I get it? It isn’t currently available anywhere, but is high up on the list of projects the foundation plans to publish. I do wish the Foundation would hurry up! It seems to me that going from a high quality scan to a printed map should be a quick process. However they are probably wasting their time trying to convert it to an adventure. Thanks for filling in the gap with maps we can get our hands on now. It may be a rights issue; my wife did the 600 DPI scan of the original paper map, and the Foundation has not yet talked to he about using her work in a publication. I don’t know the EotPT setting. Regardless, this series of Private Jakalla sewers and ruins is fascinating. Out of interest, what’s the scale of these maps? I avoid putting a scale on my maps so that DMs can adjust to suit their game. That said, I’m an old school D&D kind of guy, so when I’m drawing them I’m usually thinking 1 square = 10 feet. I was inclined to assume 10′ squares for tradition’s sake, but wanted to be sure. That would make the double-doors on some of the MPJ maps seem kinda huge. Is it possible to make a one-off contribution rather than a monthly commitment? 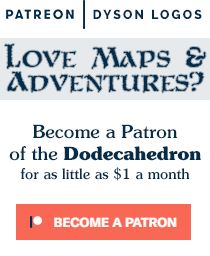 I looked but can’t see whether/how on the patreon site. If you sign up for a monthly and then cancel after the first month it works. I’ll look into other options.